The Orchard’s Finest giveaway has ended, but you can still make Pick Your Flavor Cheesecake Bars. Duncan Hines Frosting Creations Giveaway! I missed the deadline, but still love jam! Just got back from Oregon–have you tried Marionberry jam? To die for! I like grape jelly. Traditional, typical, boring, but we can’t help what we love, right? I love them all, but suppose I’m mostly a jelly type 🙂 Raspberry or strawberry depending on my mood of the day! My favorite is raspberry jam. It makes great jam bars! I prefer preserves on toast or English muffins — apricot or blackberry, please! — but prefer the smooth texture of jam or jelly for cookies (for use as a layer in bar cookies or as a filling for thumbprint cookies). Rasberry jam is the best! I like preserves and my absolute favorite is my mother’s fig preserves! I prefer strawberry jam, always! I’m a apricot preserves fan. I love mixing it into plain Greek yogurt. I like raspberry jam the best, even with the seeds! Cherry preserves are my favorite! I really like strawberry jam, especially our homemade strawberry jam. I also like strawberry-rhubarb, but the last one I bought was so sweet, I couldn’t taste the rhubarb. My favorite is one that my grandma made years ago when I was growing up. Plum jelly. When I taste it now, I always think of her. My favorite are preserves! My mother-in-law makes an amazing passionfruit and mango preserve. It’s delicious! I prefer jam, especially if it’s strawberry! I like fig preserves, but living in a city, it’s difficult to get figs to make my own and the storebought ones somehow just don’t make the cut!! Strawberry Preserves ! with toast and some tea. I don’t need anything else. I love cherry and strawberry jams. I enjoy them most straight from the jar. I learned how to make jam a couple of years ago and my friends have really enjoyed the Vanilla Almond Raspberry. I do believe that I prefer this year’s batch of Ginger Blueberry. Love peach preserves – reminds me of summer! I love preserves – especially Blueberry! I grew up on my grandma’s homemade strawberry and raspberry jam, so of course my favorite is store-bought grape jelly! I love strawberry jam………and apricot, and peach and blueberry and…. I prefer preserves to jelly, and my favorite flavor is raspberry. I love jam and my favorite flavor is blueberry rhubarb! I make tons of my own jams and jellies each year for my husband and as gifts. I think I like the 3 berry jam the best. Thanks & Happy Holidays. Cherry jam. Alternatively: Black cherry jam. I also love preserves. 🙂 Mmm, fruit. We make a lot of jams ourselves. My favorite was the time we added the pectin at the wrong time and ended up with raspberry ice cream topping instead of raspberry jam. For eating…definitely Apricot Jam. To make…Plum Jam. Definitely preserves. And I love apricot! I love love love raspberry jam and apricot jam. They are so good on thick buttered toast! Yummy! For me it depends on what i’m using it for, or what i’m in the mood for. But I love blueberry jam, and strawberry preserves. My favorite has to be raspberry preserves!!! Without a doubt my favorite is marionberry jam. Homemade blackberry a close second. Raspberry preserves– my grandma grew raspberries and made the best raspberry preserves. Homemade strawberry jam. Thanks for the giveaway and the great recipe. My favorite is Cherry Preserves! I love jelly!! My grandma used to make the best pear jelly. my favorite is the sugar free strawberry preserves. I love blackberrry jam on biscuits! I prefer jam and my favorite is raspberry! Cherry preserves are my absolute favorite! I love raspberry preserves because it is the best tasting on cookies and on bread. I prefer jam because I like fruit pieces. Love cherry and strawberry the best! Raspberry preserves are mine and my family’s favorite! We love it on toast. I also take extra pie dough and combine with preserves to make fruit centered cookies. Raspberry jam…followed closely by guava jelly! Strawberry jam is unbeatable. 🙂 Thanks for this giveaway! I am really partial to seedless raspberry jam, but I love most flavors. I prefer preserves (say that three times fast) and my favorite is a toss up between blackberry and cherry. Smuckers Red Plum Jam is my all time favorite. I’m a red berry person, and I like jam the best. I prefer Jam, and my favorite is blackberry. Blackberry is harder to find. I have also made blackberry jam, and it was wonderful! I like all of them and my favorite is a berry of some kind, blackberry, raspberry, but that cherry sounds pretty good, love them, even peach is good. Thanks for the opportunity to sample these. I like blueberry and strawberry preserves. I have to admit I do not know the difference between Jelly, jam and preserves. But I will eat any kind of berry on my toast! Raspberry jam. Soo delicious. Also, homemade peach jam. Or any homemade jam really. Orange marmalade – a miracle on toast and as an ingredient! I always buy Strawberry jam, but homemade I prefer fig! they all sound yummy though! Always preserves, my favorite being apricot! My favorite is strawberry or blackberry Jam. YUMMM! Mmmm, preserves! Now that I’m a grown up, I do love marmalade on my toast! Is that jam or preserves? Who knows — I just like it! Oh I LOVE preserves! My favorite flavors are Blueberry and Strawberry! MMMMM! Raspberry jam is my hands-down favorite! I know I would love the triple berry jam; but the tart-cherry preserves would be my second choice. I prefer jelly on sandwiches, but prefer baking with preserves. The cherry sounds awesome! Not sure if it’s a jam or preserve, but I love orange marmalade, love that bitter sweet taste. Hands down, strawberry preserves. Nothing beats this classic. It’s the best dessert substitute while babysitting, when I want to avoid the kids getting too much of a sugar rush! I am more a jam girl. I tend towards a cherry flavor too. Jams, jellies, preserves, I love you all so much, and prefer those with chunks of fruit. But my favorite is your cousin – Orange Marmalade. Sadly, the FAA regulation of 3 ounces or less has put a cramp in my buying local jams/jellies when on vacation. I like preserves. My favorite is Fall Harvest Cinnamon Apple Preserves. One day when I was making Carmelitas, I discovered (a bit late) that I didn’t have any Smucker’s Caramel Topping. I substituted the Cinnamon Apples preserves, and the resulting bars were very good! saskatoon jam is my favorite, or orange marmalade. i prefer jam or preserves. (dislike jelly). saskatoon jam is my favorite, but i’ll take strawberry or blueberry too. boysenberry jam!! i love the slight chunkiness and tartness from the berry. delicious on honeywheat toast!! Hmmmm…I’m torn between Orange marmalade and Cherry preserves. Both are my absolute favorites. Homemade Huckleberry jam can’t be beat! I love jam and preserves but don’t actually like jelly (my kids do, though.) My favorite flavor is strawberry, but I love to use orange marmalade in recipes. Love preserves and jam equally, and my favorite flavor is cherry. My vote goes to the Apricot/Peach. Love to bake with those flavors. I love blueberry preserves! YUM! I love red currant jelly! Takes me back to my grandmother’s kitchen. My favorite is Raspberry jam with seeds. Yummy. Homemade is best. In the last couple of years I have become truly fond of apricot preserves. When I was younger I hated apricot anything so this is an interesting twist for me. I’ve used the Smucker’s Orchard’s Finest Apricot and Cherry. They were both really great. I’d love to try the other flavors too. I love Smucker’s strawberry preserves! I like grape jelly and homemade seedless dewberry jelly. I am probably pretty boring–my favorite is strawberry jam! I love that stuff! Smucker’s strawberry jam. That’s the kind we ALWAYS have in the refrigerator. Jam! Blueberry first then apricot. But really, fruit and sugar is just plain yummy! My favorite is apple butter – not sure which category that falls into…. I probably buy jam or preserves more than jelly, but I can’t say that I truly have a definite preference. My favorite flavor is blackberries. I love raspberry and apricot preserves, I bake with them alot and I only use Smuckers. I love the orange marmalade on toast. I love to have little chunks or bits of fruit in my spreads – so would that be a jam or a preserve? Anyway, these all look delicious! Cherry preserves is my favorite flavor! Cherry preserves just look and taste the most homemade and authentic, imo. I can never remember the difference between jam, jelly and preserves. That apple cinnamon flavor looks really yummy though! If we’re going store-bought, I love Smucker’s apricot preserves. My favorite jam, however, is my mom’s homemade peach or strawberry – num! Preserves = Yum. Any kind of berry – berrylicious! I love it all. My favorite flavor would be Red Tart Cherry – great on toast and scones. Strawberry preserves for the win. Like a poster above, I agree that buttered toast with strawberry preserves is a total comfort food, as it a peanut butter & strawberry preserves sandwich on homestyle white bread. Like many who have posted, I’m a strawberry preserves girl. There is nothing I find as comforting as a piece of buttered toast with strawberry preserves. I like other preserved fruits as well, but strawberry is my favorite! I’m don’t really like “jelly” at all. And I’m not entirely sure what “jam” is. Strawberry preserves it is! I love the chunky texture! YUM! I love to use raspberry jam in the thumbprint cookies my mother called “Cream Cheese Cookies” because cream cheese is one of the ingredients in the cookie dough. You have to use jam (not preserves) in that cookie, otherwise the circle of raspberry would be sloppy looking. We always use a “baby spoon” (one left over from when we were babies) to carefully place the jam in the center of the dough (neatness counts in our family). I’m a raspberry jam girl all the way! Raspberry preserves are my favorite. I knew somebody would say marmalade lol, I’m definitely a jam or preserve guy, I like the fruit chunks. I have always been partial to strawberry preserves but my boys (husband and 15 year old son) LOVE cherry. Jam, apricot, and I just happen to buy .Smucker’s. Orchard’s Finest Tart Cherry Preserves are my favorite condiment ever! I can eat that stuff straight from the jar. Strawberry jam is my favorite, especially when it’s homemade using strawberries picked at the local strawberry patch! Though I became hooked on marmalade when I was living in England…on toast, on scones, on everything! I love peach or nectarine jam. I prefer jam or perserves over jelly. I have a jar of Smucker’s Orchard Perserves Peach and Apricot in the fridge. I got it at Target. I’m hooked on cherry preserves. My husband and I now live in Washington state and got hooked on raspberry jam with scones!! That is our favorite flavor with blackberry jam a close second. I love cherry preserves. I like the chunky factor and it goes great on top of plain Greek yogurt! I love preserves, and strawberry is my favorite, with peach being a close second! Preserves – yum! strawberry rhubarb is yummy. My favorite though should include marionberries – a triple berry or peach/marionberry. I love blackberry preserves, particularly on buckwheat pancakes. Yum! smuckers sugar free grape jam is the best! Preserves or jam, for sure. Strawberry and raspberry are my favorites, but cherry sounds amazing! i love the chunky texture of preserves…strawberry is my favorite! My favorite is strawberry jam. Blueberry preserves are a close second. i love cherry or raspberry preserves! Love your special blends: Michegan tart cherry; Northen woods bluberry and Triple mixed berry. Orange marmalade all the way! I prefer jam, jelly, AND preserves 🙂 Peach would be my favorite. Strawberry preserves are the best, a reminder of a summer day. Hard to beat Smucker’s Strawberry Preserves. I love having raspberry jam or preserves on hand at all times. Raspberry is great in thumbprint cookies, baked into a coffeecake or swirled on the tops of brownies before baking. I prefer preserves as well, I like the chunkiness, and I think they retain more of the fresh fruit flavor. I have tried the smuckers perserves, the “Coastal Valley Peach Apricot” is the best, it’s sweet and tastes so natural- perfect for the centers of thumbprint cookies! My local store doesnt carry the blueberry but I’d love to try it. I love prefer triple berry jam on toast, or melted, poured on top of, and then firmed up on cheese cake! I like preserves, big chunks of fruit. Thanks! strawberry preserves all the way although raspberry is a close second…. I am a marmalade girl through and through, and I am probably most partial to a good sweet orange marmalade. Of the ones you mentioned, though, I would pick jam, sour cherry. I love preserves. Getting a chunky piece of cherry is the best. Thanks for the give away! Love boysenberry preserves! Also had Triple Berry which is also good. I like jam best…strawberry jam in particular. 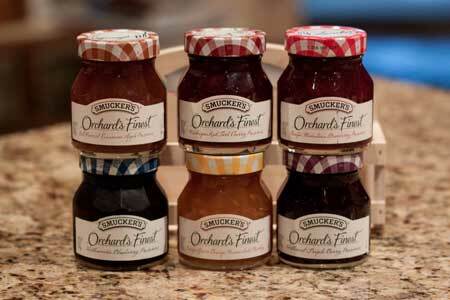 I love Smucker’s preserves – cherry is my favorite.